New York Times bestselling author Emily Winfield Martin brings a strange and wonderful place to life with her unique style of both art and writing. What do an onion-headed boy, a child-sized hedgehog, and a tattooed girl have in common? They are all orphans at Oddfellow's Orphanage! This unusual and charming chapter book tells an episodic story that follows a new orphan, Delia, as she discovers the delights of her new home. From classes in Cryptozoology and Fairy Tale Studies to trips to the circus, from Annual Hair Cutting Day to a sea monster-sighting field trip, things at Oddfellows are anything but ordinary . . . except when it comes to friendships. And in that, Oddfellows is like any other school where children discover what they mean to each other while learning how big the world really is. EMILY WINFIELD MARTIN sketches, paints, and stitches to create imaginary worlds and characters. She is the author/illustrator of The Black Apple's Paper Doll Primer. Her store, The Black Apple, has been featured in national publications and on TV shows, including the New York Times and The Martha Stewart Show. 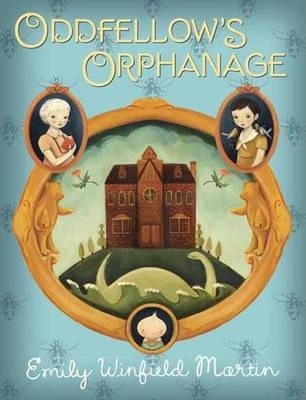 Oddfellow's Orphanage is both Emily's first book for children and her first novel! The inspiration came from the real I.O.O.F. (Independent Order of Oddfellows), dancing bears, ragtime music, and magic and mysterium of all sorts. Originally, Emily painted portraits of the children and adults at the imaginary orphanage, and from the portraits the stories emerged--enough to fill a book! Emily lives among the giant fir trees of Portland, Oregon, with her fellow adventurer, Josiah, and their cat Miette. Visit her on line at the blackapple.typepad.com or etsy.com/shop/theblackapple.